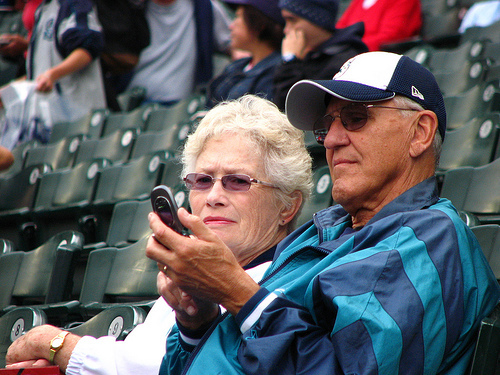 When you imagine the typical Angels or Dodgers fan, you might not think of the elderly. But with a California team in the World Series again this year, sports fans of all ages will be tuning in to watch, discussing the games the following day, and rooting for a Giants victory. Although most seniors don’t feel comfortable actually participating in athletic events like sports, they can still have a great time keeping up with their favorite teams. Even if your senior loved one has never gotten into sports, she may just find them to be a new favorite hobby! An elderly parent who lives alone at home faces many lonely evenings. After the in-home caregiver has gone home and family members are all caring for their own families, it can be discouraging to try to find something to do until bedtime. Whatever season of the year it is, chances are good that there is a baseball, football, basketball, or hockey game going on, with the excitement that only a live sporting event can provide. Once you’ve introduced your senior loved one to the fun of sports, don’t be surprised to find that she stayed up a little too late the night before to see the end of the game! A trip to a high school, college, or pro sporting event can be as simple or as large-scale as you want it to be. Either way, your elderly parent will enjoy getting out of the house for a purpose other than simply shopping for groceries or visiting the doctor. Attending a grandchild’s football, soccer, or softball game is an experience that will be a favorite topic of conversation for a long time to come! Be sure to dress warmly for a fall evening football game, and don’t forget the shade hat and sunscreen for a summer Little League baseball game. Also, be ready to leave early if necessary—you want the outing to be enjoyable for your parent, not a long, uncomfortable trip. You probably already know someone who can seemingly talk for days about his favorite sports team. Perhaps that person is your senior parent, a lifelong fan of his hometown team. Or perhaps he has never taken an interest in sports and only now has the leisure time to keep up with a team. Discussing statistics, trades, playoff chances, and the latest game is the best part about following a team, and you and your elderly parent may just find that this is your new favorite topic. And if you each root for a different team, so much the better! A spirited rivalry between parent and adult child makes for fun conversation and unforgettable memories spent watching the biggest game of the year.